Commercial carpet and upholstery is one of the first things clients, customers, and employees will notice as they enter your facility. The professional cleaners at Downing & Nelson, Co are experts at making your flooring and fabrics look their best. What makes us the correct choice isn’t just our ability to get your carpets looking their best, we also take communication and scheduling extremely seriously. We focus on ensuring you’re consulted at every step, and that our communication is clear, on time, and quickly handled. 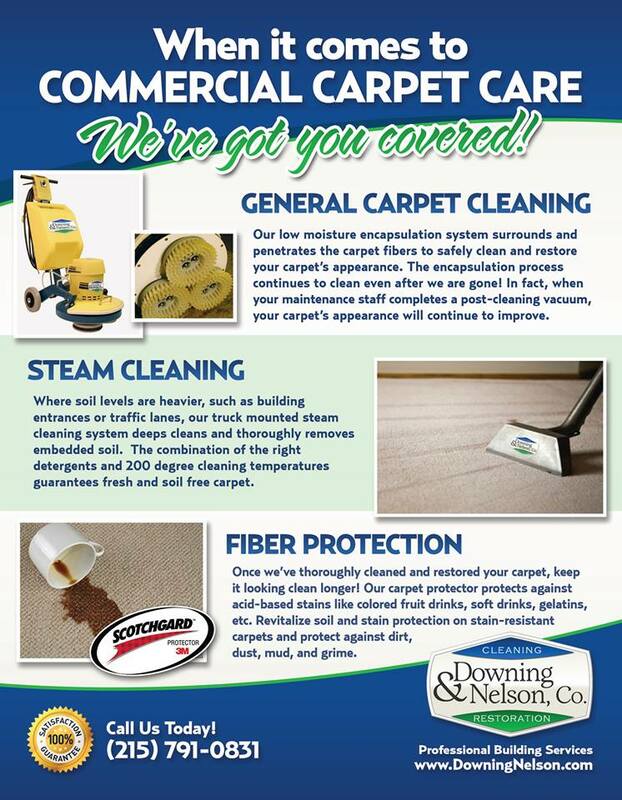 At Downing & Nelson, Co we have several different cleaning methods to meet your facility’s needs. We can use hot water extraction using our truck mounted system. We can offer low moisture cleaning on a routine basis that has the added benefit of stain blockers. Or we can do a combination of the two, using hot water extraction and low moisture cleaning in conjunction with each other, offering the cleaning power of both systems at once. Question: Do we offer night and weekend cleaning times? - Yes! We can come and clean whenever it meets your facility's schedule best. Question: Do you offer scheduled cleaning times? - We do! We can discuss the amount of traffic your carpet receives and create a schedule that best meets your cleaning needs. Once a year to once a month, we can handle it all! Question: Are you fully insured? -Yes! We have vehicle insurance, business liability, and workers compensation. Question: Do you offer a warranty? - Yes! We provide a full warranty on the work we provide. Unlike most cleaning companies, we want to earn your business.